If you are part of a multi-author book project, you can not write a review about that book because you are in it, but you certainly can buy a copy of the book when it is in the campaign phase for best-seller status. Most of the time, the Kindle version of the book will be 99 cents. Buy it when instructed and it will help the book get noticed on Amazon for the best-seller status. You can also gift the book to others. I have had many books where the authors NEVER bought the book. What is up with that? It’s 99 cents and can help everyone involved in the project. REVIEWS: You can’t review your own book, but why not REVIEW everyone’s book that you have purchased. This will help them. Even if you don’t like the book. Review it. Help the author do better. Don’t be mean about it, but be informative and instructive. This will help others readers know more about the book. So, here is my request. Buy your own books during the campaigns. Write reviews about all the books you buy You don’t have to write a long post…Maybe 100 or so words. Be honest. If you love it, give it 5 stars. If you hate, hate, hate it, give it one, but say why. If you think it’s OK, do a 3 or 4 star review and tell why. Want more tips from Tami? Ask Tami. TamaraPatzer@gmail.com or contact me. Daily Success™ Word of the Day book is set for June 2018. In the June 2018 edition, 30 people will share their original definition of a word and be interviewed by award-winning host and best-selling author Tamara Patzer on Daily Success™ Word of the Day. This is very exciting because I have been working on Daily Success™ Media Network for several years, and now it’s a reality. I have just a few openings left for June. The deadline is April 10. It’s simple. You just choose your word or two-word phrase. For example, Michele Vismaya Rubin will describe the word Gratitude in 150 words or less, and include her 200-word bio, and photo. She will be interviewed on Daily Success™ Word of the Day with Tamara Patzer and discuss what GRATITUDE means and how it can help you achieve Daily Success™. Think about these conversations. WOW! I am excited. I will talk with Troy Fullwood about the word Thrive. Can you imagine how deep we can dive into ONE WORD and what it can mean to your Daily Success™? There are just a few words left for theJune 2018 edition. Does the word inspiration grab you? What about reinvention? How about transition? Talk to Tami tamarapatzer@gmail.com or 941-421-6563. Deadline is coming. Act today. Opportunity is knocking. Want to be part of Tamara Patzer’s shows or book series? Just ask and find out more at TamaraPatzer@gmail.com or use the contact form on this site. What helps a person grow as a thought leader? What life lessons help develop strong entrepreneurial and business skills? Thought leaders from around the globe met at the annual Thought Leaders Conference Business Expert Forum sponsored by Entrepreneurship Club at Harvard Business School. Eight business leaders, professionals, and functional medicine doctors shared their ideas about the most valuable lessons they have learned that helped them become a thought leader and expert in their fields. Thought Leaders come from a variety of backgrounds. Ask yourself the question: What makes me a unique thought leader and how can I share my big message and big mission with the world? You may wonder why an Author Central page is vital to your Beyond the Best Seller™ Marketing campaign. It’s simple: It’s free and Amazon is giving you third-person credibility. 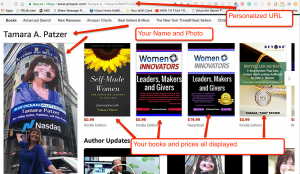 Here is a sample of my Author Central Page.Tamara A. Patzer Amazon Central Page. 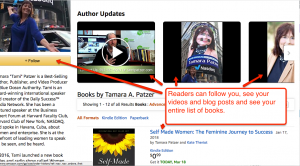 Notice you will get a personalized URL and your name is featured along with your photos, blogs, videos, blog posts, and book covers. Use this free resource. It can help you market your books and help take you Beyond the Best Seller™. Go here to make your own Author Central Profile page in the USA.